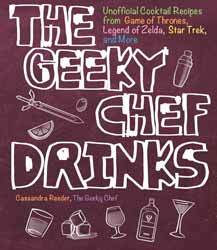 Following on from lasts year's (2017) The Geeky Chef Strikes Back, Cassandra Reeder (aka The Geeky Chef) brings us the perfect accompaniment in The Geeky Chef Drinks. This book includes easy, step-by-step, instructions and beautiful photography of the finished drinks. I was particularly impressed with some of the drinking vessels used (you should easily be able to find interesting and unusual glasses in numerous stores in any city high street. Or even search for unusual glass receptacles online. There are plenty of alcoholic and non alcoholic beverages to set any sci-fi themed party off with a bang. If you host any sort of themed dinner parties then this is an essential book. I've been slowly making my way through making these and not only are they a lot of fun, but make for interesting new taste sensations. It also explains how to create some of the special effects (like mist and fire based effects) as well as how to create some of the syrups you'll need. This also means that you can get a little creative and design your own concoctions.